This article is about the weapon. For wildfires etc., see Greek fires. For the band, see Greek Fire (band). Greek fire was an incendiary weapon used by the Eastern Roman (Byzantine) Empire that was first developed c. 672. It was a combustible compound emitted by a flame-throwing weapon and used to set light to enemy ships. Greek fire was first used by the Greeks besieged in Constantinople (673–78). It ignited on contact with water, and was probably based on naphtha and quicklime. 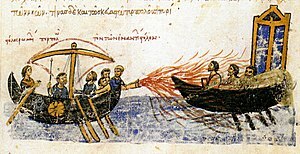 The Byzantines typically used it in naval battles to great effect, as it could continue burning while floating on water. It provided a technological advantage and was responsible for many key Byzantine military victories, most notably the salvation of Constantinople from two Arab sieges, thus securing the Empire's survival. The impression made by Greek fire on the western European Crusaders was such that the name was applied to any sort of incendiary weapon, including those used by Arabs, the Chinese, and the Mongols. However, these were different mixtures and not the same formula as the Byzantine Greek fire, which was a closely guarded state secret. 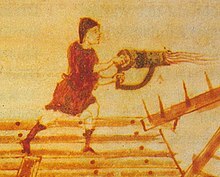 Byzantines also used pressurized nozzles or siphōns to project the liquid onto the enemy, in a manner resembling a modern flamethrower. Although usage of the term "Greek fire" has been general in English and most other languages since the Crusades, original Byzantine sources called the substance a variety of names, such as "sea fire" (Medieval Greek: πῦρ θαλάσσιον pŷr thalássion), "Roman fire" (πῦρ ῥωμαϊκόν pŷr rhōmaïkón), "war fire" (πολεμικὸν πῦρ polemikòn pŷr), "liquid fire" (ὑγρὸν πῦρ hygròn pŷr), "sticky fire" (πῦρ κολλητικόν pŷr kollētikón) or "manufactured fire" (πῦρ σκευαστόν pŷr skeuastón). The composition of Greek fire remains a matter of speculation and debate, with various proposals including combinations of pine resin, naphtha, quicklime, calcium phosphide, sulfur, or niter. In Titus Livy's history of Rome, priestesses of Bacchus are said to have dipped fire into the water, which did not extinguish, "for it was sulphur mixed with lime." Automatic fire also by the following formula. This is the recipe: take equal amounts of sulphur, rock salt, ashes, thunder stone, and pyrite and pound fine in a black mortar at midday sun. Also in equal amounts of each ingredient mix together black mulberry resin and Zakynthian asphault, the latter in a liquid form and free-flowing, resulting in a product that is sooty colored. Then add to the asphalt the tiniest amount of quicklime. But because the sun is at its zenith, one must pound it carefully and protect the face, for it will ignite suddenly. When it catches fire, one should seal it in some sort of copper receptacle; in this way you will have it available in a box, without exposing it to the sun. If you should wish to ignite enemy armaments, you will smear it on in the evening, either on the armaments or some other object, but in secret; when the sun comes up, everything will be burnt up. At that time Kallinikos, an artificer from Heliopolis, fled to the Romans. He had devised a sea fire which ignited the Arab ships and burned them with all hands. Thus it was that the Romans returned with victory and discovered the sea fire. The accuracy and exact chronology of this account is open to question: Theophanes reports the use of fire-carrying and siphōn-equipped ships by the Byzantines a couple of years before the supposed arrival of Kallinikos at Constantinople. If this is not due to chronological confusion of the events of the siege, it may suggest that Kallinikos merely introduced an improved version of an established weapon. The historian James Partington further thinks it likely that Greek fire was not in fact the creation of any single person but "invented by chemists in Constantinople who had inherited the discoveries of the Alexandrian chemical school." Indeed, the 11th-century chronicler George Kedrenos records that Kallinikos came from Heliopolis in Egypt, but most scholars reject this as an error. Kedrenos also records the story, considered rather implausible by modern scholars, that Kallinikos' descendants, a family called Lampros, "brilliant," kept the secret of the fire's manufacture and continued doing so to Kedrenos' time. Kallinikos' development of Greek fire came at a critical moment in the Byzantine Empire's history: weakened by its long wars with Sassanid Persia, the Byzantines had been unable to effectively resist the onslaught of the Muslim conquests. Within a generation, Syria, Palestine, and Egypt had fallen to the Arabs, who in c. 672 set out to conquer the imperial capital of Constantinople. Greek fire was used to great effect against the Muslim fleets, helping to repel the Muslims at the first and second Arab sieges of the city. Records of its use in later naval battles against the Saracens are more sporadic, but it did secure a number of victories, especially in the phase of Byzantine expansion in the late 9th and early 10th centuries. Utilisation of the substance was prominent in Byzantine civil wars, chiefly the revolt of the thematic fleets in 727 and the large-scale rebellion led by Thomas the Slav in 821–823. In both cases, the rebel fleets were defeated by the Constantinopolitan Imperial Fleet through the use of Greek fire. The Byzantines also used the weapon to devastating effect against the various Rus' raids on the Bosporus, especially those of 941 and 1043, as well as during the Bulgarian war of 970–971, when the fire-carrying Byzantine ships blockaded the Danube. The importance placed on Greek fire during the Empire's struggle against the Arabs would lead to its discovery being ascribed to divine intervention. The Emperor Constantine Porphyrogennetos (r. 945–959), in his book De Administrando Imperio, admonishes his son and heir, Romanos II (r. 959–963), to never reveal the secrets of its composition, as it was "shown and revealed by an angel to the great and holy first Christian emperor Constantine" and that the angel bound him "not to prepare this fire but for Christians, and only in the imperial city." As a warning, he adds that one official, who was bribed into handing some of it over to the Empire's enemies, was struck down by a "flame from heaven" as he was about to enter a church. As the latter incident demonstrates, the Byzantines could not avoid capture of their precious secret weapon: the Arabs captured at least one fireship intact in 827, and the Bulgars captured several siphōns and much of the substance itself in 812/814. This, however, was apparently not enough to allow their enemies to copy it (see below). The Arabs, for instance, employed a variety of incendiary substances similar to the Byzantine weapon, but they were never able to copy the Byzantine method of deployment by siphōn, and used catapults and grenades instead. Greek fire continued to be mentioned during the 12th century, and Anna Komnene gives a vivid description of its use in a naval battle against the Pisans in 1099. However, although the use of hastily improvised fireships is mentioned during the 1203 siege of Constantinople by the Fourth Crusade, no report confirms the use of the actual Greek fire. This might be because of the general disarmament of the Empire in the 20 years leading up to the sacking, or because the Byzantines had lost access to the areas where the primary ingredients were to be found, or even perhaps because the secret had been lost over time. Records of a 13th-century event in which "Greek fire" was used by the Saracens against the Crusaders can be read through the Memoirs of the Lord of Joinville during the Seventh Crusade. One description of the memoir says "the tail of fire that trailed behind it was as big as a great spear; and it made such a noise as it came, that it sounded like the thunder of heaven. It looked like a dragon flying through the air. Such a bright light did it cast, that one could see all over the camp as though it were day, by reason of the great mass of fire, and the brilliance of the light that it shed." In the 19th century, it is reported that an Armenian by the name of Kavafian approached the government of the Ottoman Empire with a new type of Greek fire he claimed to have developed. Kavafian refused to reveal its composition when asked by the government, insisting that he be placed in command of its use during naval engagements. Not long after this, he was poisoned by imperial authorities, without their ever having found out his secret. As Constantine Porphyrogennetos' warnings show, the ingredients and the processes of manufacture and deployment of Greek fire were carefully guarded military secrets. So strict was the secrecy that the composition of Greek fire was lost forever and remains a source of speculation. Consequently, the "mystery" of the formula has long dominated the research into Greek fire. Despite this almost exclusive focus, however, Greek fire is best understood as a complete weapon system of many components, all of which were needed to operate together to render it effective. This comprised not only the formula of its composition, but also the specialized dromon ships that carried it into battle, the device used to prepare the substance by heating and pressurizing it, the siphōn projecting it, and the special training of the siphōnarioi who used it. Knowledge of the whole system was highly compartmentalised, with operators and technicians aware of the secrets of only one component, ensuring that no enemy could gain knowledge of it in its entirety. This accounts for the fact that when the Bulgarians took Mesembria and Debeltos in 814, they captured 36 siphōns and even quantities of the substance itself, but were unable to make any use of them. This fire is made by the following arts. From the pine and the certain such evergreen trees inflammable resin is collected. This is rubbed with sulfur and put into tubes of reed, and is blown by men using it with violent and continuous breath. Then in this manner it meets the fire on the tip and catches light and falls like a fiery whirlwind on the faces of the enemies. At the same time, the reports by Western chroniclers of the famed ignis graecus are largely unreliable, since they apply the name to any and all sorts of incendiary substances. It burned on water, and, according to some interpretations, was ignited by water. In addition, as numerous writers testify, it could be extinguished only by a few substances, such as sand (which deprived it of oxygen), strong vinegar, or old urine, presumably by some sort of chemical reaction. It was a liquid substance, and not some sort of projectile, as verified both by descriptions and the very name "liquid fire." At sea, it was usually ejected from a siphōn, although earthenware pots or grenades filled with it or similar substances were also used. The discharge of Greek fire was accompanied by "thunder" and "much smoke." The first and, for a long time, most popular theory regarding the composition of Greek fire held that its chief ingredient was saltpeter, making it an early form of gunpowder. This argument was based on the "thunder and smoke" description, as well as on the distance the flame could be projected from the siphōn, which suggested an explosive discharge. From the times of Isaac Vossius, several scholars adhered to this position, most notably the so-called "French school" during the 19th century, which included chemist Marcellin Berthelot. This view has been rejected since, as saltpeter does not appear to have been used in warfare in Europe or the Middle East before the 13th century, and is absent from the accounts of the Muslim writers—the foremost chemists of the early medieval world—before the same period. In addition, the nature of the proposed mixture would have been radically different from the siphōn-projected substance described by Byzantine sources. A second view, based on the fact that Greek fire was inextinguishable by water (some sources suggest that water intensified the flames) suggested that its destructive power was the result of the explosive reaction between water and quicklime. Although quicklime was certainly known and used by the Byzantines and the Arabs in warfare, the theory is refuted by literary and empirical evidence. A quicklime-based substance would have to come in contact with water to ignite, while Emperor Leo's Tactica indicate that Greek fire was often poured directly on the decks of enemy ships, although admittedly, decks were kept wet due to lack of sealants. Likewise, Leo describes the use of grenades, which further reinforces the view that contact with water was not necessary for the substance's ignition. Furthermore, C. Zenghelis pointed out that, based on experiments, the actual result of the water–quicklime reaction would be negligible in the open sea. Another similar proposition suggested that Kallinikos had in fact discovered calcium phosphide, which can be made by boiling bones in urine within a sealed vessel. On contact with water, calcium phosphide releases phosphine, which ignites spontaneously. However, extensive experiments with it also failed to reproduce the described intensity of Greek fire. Although the presence of either quicklime or saltpeter in the mixture cannot be entirely excluded, they were consequently not the primary ingredient. Most modern scholars agree that Greek fire was based on petroleum, either crude or refined; comparable to modern napalm. The Byzantines had easy access to crude oil from the naturally occurring wells around the Black Sea (e.g., the wells around Tmutorakan noted by Constantine Porphyrogennetos) or in various locations throughout the Middle East. An alternate name for Greek fire was "Median fire" (μηδικὸν πῦρ), and the 6th-century historian Procopius records that crude oil, called "naphtha" (in Greek: νάφθα naphtha, from Old Persian 𐎴𐎳𐎫 naft) by the Persians, was known to the Greeks as "Median oil" (μηδικὸν ἔλαιον). This seems to corroborate the use of naphtha as a basic ingredient of Greek fire. Naphtha was also used by the Abbasids in the 9th century, with special troops, the naffāṭūn, who wore thick protective suits and used small copper vessels containing burning oil, which they threw onto the enemy troops. There is also a surviving 9th century Latin text, preserved at Wolfenbüttel in Germany, which mentions the ingredients of what appears to be Greek fire and the operation of the siphōns used to project it. Although the text contains some inaccuracies, it clearly identifies the main component as naphtha. Resins were probably added as a thickener (the Praecepta Militaria refer to the substance as πῦρ κολλητικόν, "sticky fire"), and to increase the duration and intensity of the flame. A modern theoretical concoction included the use of pine tar and animal fat along with other ingredients. A 12th century treatise prepared by Mardi bin Ali al-Tarsusi for Saladin records an Arab version of Greek fire, called naft, which also had a petroleum base, with sulfur and various resins added. Any direct relation with the Byzantine formula is unlikely. An Italian recipe from the 16th century has been recorded for recreational use; it includes coal from a willow tree, alcohol, incense, sulfur, wool and camphor as well as two undetermined components (burning salt and pegola); the concoction was guaranteed to "burn under water" and to be "beautiful." 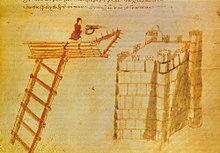 Use of a cheirosiphōn ("hand-siphōn"), a portable flamethrower, used from atop a flying bridge against a castle. Illumination from the Poliorcetica of Hero of Byzantium. The chief method of deployment of Greek fire, which sets it apart from similar substances, was its projection through a tube (siphōn), for use aboard ships or in sieges. Portable projectors (cheirosiphōnes, χειροσίφωνες) were also invented, reputedly by Emperor Leo VI. 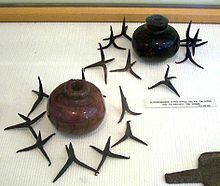 The Byzantine military manuals also mention that jars (chytrai or tzykalia) filled with Greek fire and caltrops wrapped with tow and soaked in the substance were thrown by catapults, while pivoting cranes (gerania) were employed to pour it upon enemy ships. The cheirosiphōnes especially were prescribed for use at land and in sieges, both against siege machines and against defenders on the walls, by several 10th-century military authors, and their use is depicted in the Poliorcetica of Hero of Byzantium. The Byzantine dromons usually had a siphōn installed on their prow under the forecastle, but additional devices could also on occasion be placed elsewhere on the ship. Thus in 941, when the Byzantines were facing the vastly more numerous Rus' fleet, siphōns were placed also amidships and even astern. As he [the Emperor Alexios I] knew that the Pisans were skilled in sea warfare and dreaded a battle with them, on the prow of each ship he had a head fixed of a lion or other land-animal, made in brass or iron with the mouth open and then gilded over, so that their mere aspect was terrifying. And the fire which was to be directed against the enemy through tubes he made to pass through the mouths of the beasts, so that it seemed as if the lions and the other similar monsters were vomiting the fire. ...having built a furnace right at the front of the ship, they set on it a copper vessel full of these things, having put fire underneath. And one of them, having made a bronze tube similar to that which the rustics call a squitiatoria, "squirt," with which boys play, they spray [it] at the enemy. The account, albeit embellished, corresponds with many of the characteristics of Greek fire known from other sources, such as a loud roar that accompanied its discharge. These two texts are also the only two sources that explicitly mention that the substance was heated over a furnace before being discharged; although the validity of this information is open to question, modern reconstructions have relied upon them. Based on these descriptions and the Byzantine sources, John Haldon and Maurice Byrne designed a hypothetical apparatus as consisting of three main components: a bronze pump, which was used to pressurize the oil; a brazier, used to heat the oil (πρόπυρον, propyron, "pre-heater"); and the nozzle, which was covered in bronze and mounted on a swivel (στρεπτόν, strepton). The brazier, burning a match of linen or flax that produced intense heat and the characteristic thick smoke, was used to heat oil and the other ingredients in an airtight tank above it, a process that also helped to dissolve the resins into a fluid mixture. The substance was pressurized by the heat and the usage of a force pump. After it had reached the proper pressure, a valve connecting the tank with the swivel was opened and the mixture was discharged from its end, being ignited at its mouth by some source of flame. The intense heat of the flame made necessary the presence of heat shields made of iron (βουκόλια, boukolia), which are attested in the fleet inventories. The process of operating Haldon and Byrne's design was fraught with danger, as the mounting pressure could easily make the heated oil tank explode, a flaw which was not recorded as a problem with the historical fire weapon. In the experiments conducted by Haldon in 2002 for the episode "Fireship" of the television series Machines Times Forgot, even modern welding techniques failed to secure adequate insulation of the bronze tank under pressure. This led to the relocation of the pressure pump between the tank and the nozzle. The full-scale device built on this basis established the effectiveness of the mechanism's design, even with the simple materials and techniques available to the Byzantines. The experiment used crude oil mixed with wood resins, and achieved a flame temperature of over 1,000 °C (1,830 °F) and an effective range of up to 15 meters (49 ft). The portable cheirosiphōn ("hand-siphōn"), the earliest analogue to a modern flamethrower, is extensively attested in the military documents of the 10th century, and recommended for use in both sea and land. They first appear in the Tactica of emperor Leo VI the Wise, who claims to have invented them. Subsequent authors continued to refer to the cheirosiphōnes, especially for use against siege towers, although Nikephoros II Phokas also advises their use in field armies, with the aim of disrupting the enemy formation. Although both Leo VI and Nikephoros Phokas claim that the substance used in the cheirosiphōnes was the same as in the static devices used on ships, Haldon and Byrne consider that the former were manifestly different from their larger cousins, and theorize that the device was fundamentally different, "a simple syringe [that] squirted both liquid fire (presumably unignited) and noxious juices to repel enemy troops." The illustrations of Hero's Poliorcetica show the cheirosiphōn also throwing the ignited substance,  but such illustrations were narrative in intent, so that showing the device throwing the ignited substance may have seemed preferable to trying to clearly illustrate throwing the unignited substance and then igniting it. In its earliest form, Greek fire was hurled onto enemy forces by firing a burning cloth-wrapped ball, perhaps containing a flask, using a form of light catapult, most probably a seaborne variant of the Roman light catapult or onager. These were capable of hurling light loads, around 6 to 9 kg (13 to 20 lb), a distance of 350–450 m (380–490 yd). Although the destructiveness of Greek fire is indisputable, it did not make the Byzantine navy invincible. It was not, in the words of naval historian John Pryor, a "ship-killer" comparable to the naval ram, which, by then, had fallen out of use. While Greek fire remained a potent weapon, its limitations were significant when compared to more traditional forms of artillery: in its siphōn-deployed version, it had a limited range, and it could be used safely only in a calm sea and with favourable wind conditions. The Muslim navies eventually adapted themselves to it by staying out of its effective range and devising methods of protection such as felt or hides soaked in vinegar. In C. J. Sansom's historical mystery novel Dark Fire, Thomas Cromwell sends the lawyer Matthew Shardlake to recover the secret of Greek fire, following its discovery in the library of a dissolved London monastery. In Michael Crichton's sci-fi novel Timeline, Professor Edward Johnston is stuck in the past in 14th century Europe, and claims to have knowledge of Greek fire. In Mika Waltari's novel The Dark Angel, some old men who are the last ones who know the secret of Greek fire are mentioned as present in the last Christian services held in Hagia Sophia before the Fall of Constantinople. The narrator is told that in the event of the city's fall, they will be killed so as to keep the secret from the Turks. In George R. R. Martin's fantasy series of novels A Song of Ice and Fire, and its adaptation Game of Thrones, Wildfire is similar to Greek fire. It was used in naval battles as it could remain lit on water, and its secret recipe was protected immensely. ^ Pryor & Jeffreys 2006, pp. 608–609. ^ a b c d Forbes 1959, p. 83. ^ Leicester 1971, p. 75. ^ Crosby 2002, pp. 88–89. ^ Partington 1999, pp. 1–5. ^ Forbes 1959, pp. 70–74. ^ Julius Africanus, The Cestus, D25, 116-117. ^ Partington 1999, p. 5. ^ Pryor & Jeffreys 2006, pp. 607–609. ^ Theophanes & Turtledove 1982, p. 53. ^ Theophanes & Turtledove 1982, p. 52. ^ Roland 1992, p. 657. ^ a b Pryor & Jeffreys 2006, p. 608. ^ Partington 1999, pp. 12–13. ^ Forbes 1959, p. 80. ^ Pryor & Jeffreys 2006, pp. 26–27, 31–32. ^ Pryor & Jeffreys 2006, pp. 61–62, 72. ^ Pryor & Jeffreys 2006, pp. 32, 46, 73. ^ Pryor & Jeffreys 2006, pp. 86, 189. ^ Moravcsik & Jenkins 1967, pp. 68–71. ^ Forbes 1959, p. 82. ^ Pryor & Jeffreys 2006, pp. 609–611. ^ Roland 1992, pp. 660, 663–664. ^ Pryor & Jeffreys 2006, p. 110. ^ Pryor & Jeffreys 2006, pp. 630–631. ^ Haldon 2006, p. 316. ^ (in Armenian) Adjarian, Hrachia. "Հայոց դերը Օսմանյան կայսրության մեջ," [The role of Armenians in the Ottoman Empire] Banber Erevani Hamalsarani 1967; trans. in Charles Issawi, The Economic History of Turkey, 1800-1914, Chicago: University of Chicago Press, 1980, p. 64. ^ a b Haldon 2006, p. 290. ^ Roland 1992, pp. 660, 663. ^ Roland 1992, pp. 663–664. ^ Theophanes & Turtledove 1982, p. 178. ^ Roland 1992, p. 663. ^ Pryor & Jeffreys 2006, p. 609. ^ Partington 1999, pp. 19, 29. ^ Ellis Davidson 1973, p. 64. ^ Scott, James Sibbald David, (Sir), (1868)The British army: its origin, progress, and equipment, p. 190. ^ a b c d Roland 1992, pp. 657–658. ^ a b c d Cheronis 1937, pp. 362–363. ^ a b c Pryor & Jeffreys 2006, p. 617. ^ Partington 1999, p. 14. ^ a b Haldon & Byrne 1977, p. 92. ^ Ellis Davidson 1973, pp. 69–70. ^ a b Roland 1992, p. 659. ^ Roland 1992, pp. 658–659. ^ Ellis Davidson 1973, p. 69. ^ al-Hassan 2001, pp. 41–83. ^ Partington 1999, pp. 21–22. ^ Forbes 1959, pp. 83–84. ^ Partington 1999, pp. 6–10, 14. ^ Roland 1992, p. 660. ^ Zenghelis 1932, p. 270. ^ Colin McEvedy (1992), The New Penguin Atlas of Medieval History, New York: Penguin. ^ Cheronis 1937, p. 363. ^ a b Ellis Davidson 1973, p. 70. ^ Partington 1999, p. 4. ^ Forbes 1959, pp. 82–84. ^ Ellis Davidson 1973, p. 62. ^ Partington 1999, p. 22. ^ a b Pryor & Jeffreys 2006, pp. 614–616. ^ a b Haldon 2006, p. 310. ^ Pryor & Jeffreys 2006, p. 618. ^ "The Link: Greek Fire". National Geographic. Retrieved 22 April 2013. ^ Pryor & Jeffreys 2006, pp. 610–611. ^ Cortese, Isabella (1565). I Segreti della signora. Venice: Giovanni Bariletto. p. 62. Retrieved 23 February 2016. ^ Pryor & Jeffreys 2006, pp. 378–379, 609. ^ Forbes 1959, pp. 86–87. ^ a b Pryor & Jeffreys 2006, pp. 617–619. ^ Haldon 2006, p. 295. ^ Pryor & Jeffreys 2006, pp. 203, 618. ^ Dawes 1928, p. 292. ^ Pryor & Jeffreys 2006, pp. 616–617. ^ Ellis Davidson 1973, p. 72. ^ Pryor & Jeffreys 2006, pp. 628–629. ^ Haldon 2006, p. 315. ^ Haldon & Byrne 1977, p. 93. ^ Haldon & Byrne 1977, p. 94. ^ Haldon & Byrne 1977, p. 95. ^ Pryor & Jeffreys 2006, pp. 624–626. ^ Haldon & Byrne 1977, p. 96. ^ Pryor & Jeffreys 2006, pp. 627–628. ^ Haldon & Byrne 1977, p. 97. ^ Pryor & Jeffreys 2006, p. 627. ^ Pryor 2003, p. 97. ^ Pryor & Jeffreys 2006, p. 384. ^ A wherry across the Thames The Guardian, 6 November 2004. Christides, Vassilios (1993), "Nafṭ", The Encyclopedia of Islam, New Edition, Volume VII: Mif–Naz, Leiden and New York: BRILL, pp. 884–886, ISBN 90-04-09419-9. Wikimedia Commons has media related to Greek fire. Wikisource has the text of the 1911 Encyclopædia Britannica article Greek Fire. "Technoporn: Greek Fire". Wired Blog. December 29, 2006. Greek Fire – The Best Kept Secret of the Ancient World. By Richard Groller. “Greek Fire.” The Middle Ages website, http://www.middle-ages.org.uk/greek-fire.htm, Retrieved on 13 March 2013. “Greek Fire.” The University of Calgary, https://www.ucalgary.ca/applied_history/tutor/oldwrld/armies/greekfire.html, 2000. Retrieved on 10 March 2013. “The Link: Greek Fire.” National Geographic website. http://channel.nationalgeographic.com/channel/the-link/videos/greek-fire/, 1 May 2012. Retrieved on 9 Mar 2013.